Check flight details with your airline as soon as possible, if your flight is cancelled you may be better off staying at home. Keep checking for up to date information about the airport either through Airport Guide’s Twitter or by calling the airline directly. Contacting your airline – even by just checking their website – is really one of the best ways to find out what the latest news is. Try to stay calm, you’re in safe hands, the airlines know what they are doing and if your flight has been delayed or cancelled it is for your own safety! If your flight has been cancelled make sure your airline transfers your flight. Probably the most important one, leave yourself plenty of time to get to the airport as driving to the airport is probably the most dangerous part of your journey. The main thing is try to stay calm, the airlines are doing everything they can to get your flight in the air without putting anyone in jeopardy. Find out if you are owed compensation for your flight delay or cancellation! If my flight is cancelled by the airline what am I entitled to? If your airline cancels your flight the airline must give you the option of rebooking an alternative flight or requesting a refund. If my flight is cancelled by the airline and I have to rebook a new flight, will the airline provide compensation for my accommodation and meals while I wait for the new flight? If your re-booked flight leaves 2 hours after the scheduled flight your airline should provide you with free meals while you wait and accommodation if needed. The level of compensation will depend on the distance you are travelling and how much later you will arrive from the original flight. If my flight is cancelled and I have to cancel my holiday will my airline pay for the other arrangements I have had to cancel such as my hotel and transfer? If the flight is cancelled due to reasons out of the airline’s control they will not pay for cancellation of your accommodation or cancellation of any other arrangements. However, if you have taken out a comprehensive travel insurance policy when you booked your holiday you should be able to claim back most of the expenses incurred from cancelling the holiday from your travel insurance provider. What should I do if my flight is cancelled and there are no alternative flights available at the airport? The airline has a legal obligation to provide you with a flight to your destination as your ticket is a contract with them. If there are no later flights available you should ask the airline to book you a flight from another airport and pay for your transport to that airport. If this is not an option then you should consider alternative modes of transport. For example, if you are trying to get within Europe you could consider hiring a car and driving to your destination. Some car hire providers will let you drive your hired vehicle across Europe and drop it off in your destination country. However, this can sometimes incur a large charge as they have to then bring the car back to the original country. Alternatively, passengers trying to get to France or Belgium could try and take the Eurostar. The Eurostar is a train which travels from London St Pancreas train station to Paris and Brussels. However, if you are not travelling within Europe none of these modes of transport would be an option. Therefore if you are travelling internationally and you cannot get a flight with your airline from your airport you should try and get a flight from any airport within the UK. 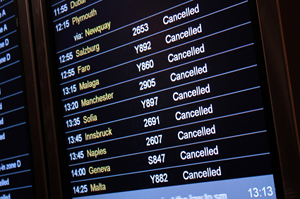 What compensation does my travel insurance provide if my flight is cancelled? All travel insurance policies are different and offer different levels of cover. It is best you contact your insurance provider or read the policy wording document on their website to find out how much compensation you are entitled to if your flights are cancelled or delayed. If my flight is delayed by the operating airline what compensation am I entitled to? You are not eligible for financial compensation if your flight is delayed but you are entitled to food, refreshments and accommodation if your flight is delayed overnight. The airline should also provide you with free communication so you can contact family and friends. Your airline must agree to providing you with accommodation before you book it and they are in their right to deny any excessive expenses claims. If your flight is delayed by over 5 hours you can request a refund and the option not to travel. What happens if I am stranded abroad and cannot get back to work, will my employer still pay me? Your employer is not entitled to pay you if you cannot get to work due to your flights being cancelled or delayed. It is up to your employer how they proceed, they may request you take the time as holiday, take the days as unpaid or request you work remotely from your location if possible. It is best you contact your employer to discuss the options available to you. My flight has been cancelled/delayed and I’m travelling with small children. You may not be lucky enough to be stranded at Frankfurt’s international airport where four clowns have been hired to perform in the terminals but there are still plenty of ways to keep the kids entertained in the midst of all the chaos and avoid any more stress. Most major airports will have unsupervised play areas that young children can use as well as there being shops to browse and other amusements throughout the terminal. If your willing to pay to enter an airport lounge then there will be toys, games, an arcade and magazines available. You can’t go wrong with the classics, a game of “I spy” requires nothing but a keen eye and can be an excellent way of keeping children amused if you need to spend a minute sorting out your travel arrangements. Through a child’s eyes an airport can look like one big playground. As long as there is supervision letting the kids ride the escalators up and down and play with the trolleys may get rid of the pent up energy they may have accumulated from all the waiting around. I need to get to the airport but there are major transport disruptions. The effects caused by severe weather conditions is not only likely to impact airport flight schedules but can also cause delays and disruptions throughout the major transport networks across the UK. Striking action can also lead to disruptions which although usually localised to certain organisation and locations can still affect your journey. Unfortunately, this can and does lead to many passengers having a very stressful time getting to the airport, with some failing to make their flight altogether. The key to avoid these problems however lays simply in planning your journey effectively. In situations where there is snow and ice drivers are urged to keep plenty of distance between vehicles and drive slowly to ensure they’re always completely in control of their vehicle. Trains may also be travelling at slower speeds than usual. Taking the extra time it will take to reach your destination into consideration when planning your journey will help ensure you make it in plenty of time. Keeping yourself informed will play a major part in streamlining your journey. Utilise news websites, twitter and radio so your up-to-date with the latest news regarding your method of transportation which should help you avoid any problematic routes. There can sometimes be cases where it just wont be possible for you to make your flight, for example weather that is so severe that it is unsafe for you to travel. In such circumstances where no one is really at fault you should check your flight’s status and speak to your airline as it’s more than likely to be affected if the weather conditions are that bad or alternatively look to your travel insurance for compensation. 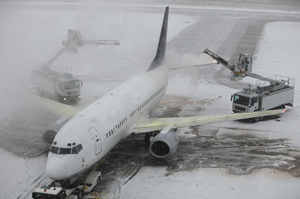 Why does snow disrupt the airports so much? Airports are disrupted due to snow because of the additional processes that need to be undertaken to make sure planes are safe to fly. 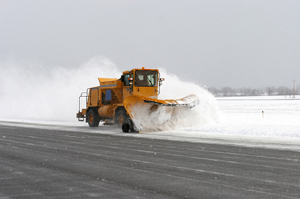 Roads and runways need to be cleared of snow and ice and planes must be de-iced. A plane must be completely de-iced before it can take off as any ice affects the aircraft wings and fuselage which makes the planes more difficult to control. In severe cold temperatures they must take off as soon as they are de-iced to prevent ice building up again, therefore this causes delays as de-icing cannot be done in advance at the start of the day. The runways and roads must also be snow and ice free. If the airport is covered in heavy snow then it may have to be closed whilst the clearing takes place. Planes cannot take off when there is any snow on the ground. Larger airports like Heathrow and Gatwick are more impacted by severe weather than smaller airports as they have so many flights that a delay of a few hours causes a huge backlog of flights.